Cardinal Stepinac: A cold-blooded killer being fast-tracked to Roman Catholic “sainthood” — 1389 Blog - Counterjihad! Some of the pictures in this video are quite disturbing and shocking, therefore we wish to warn people before viewing this fascinating and yet very distressing clip. Alexei Ilyich Osipov: Why Are We Orthodox? In order to understand what one or another Christian Church is, it is enough, without even touching its doctrine, to look at its saints. The tree is known by its fruits, and any Church declares those people saints who embodied its ideal in their lives. A saint’s canonization therefore reflects that Church’s testimony not only about the Christian it is holding up as an example to follow, but it is also primarily the given Church’s testimony about its own self. You can more accurately judge the authenticity, or false sanctity, of the Church itself by its saints. Now, first of all, I will pause at the comparison between the saints of the largest Christian Churches—the [Roman] Catholic and the Orthodox Churches. Here we must note that the nature of these stigmata is well known in psychiatry. Unceasing concentration of the attention on Christ’s sufferings on the cross extremely arouse a person’s nerves and psyche, and if practiced long enough, can evoke this phenomenon. There is nothing supernatural or miraculous here. In this “compassion” for Christ, there is not the true love about which the Lord spoke plainly: He that hath my commandments, and keepeth them, he it is that loveth me (Jn. 14:21). To the contrary, the substitution of dreamy experiences of “compassion” for the struggle with one’s own sinful passions is one of the most serious mistakes in spiritual life, which has lead, and still leads, ascetics to self-conceit and pride—obvious prelest, often connected with outright psychological disturbance (see the “sermon” of St. Francis to the birds, the wolf, the turtle-doves, the snakes, the flowers, etc. ; his reverence before the fire, the stones, the worms). It is no wonder therefore that St. Francis claimed to redeem the sins of other people through his imitation of Christ. Also telling is the life’s goal that St. Francis set for himself: “I labored and want to labor … because this brings honor.”[ii] Isn’t this why he said openly at the end of his life, “I am not aware of any sin on my part that I have not redeemed through confession and repentance”? [iii] All this testifies to his ignorance of his own sins, his unworthiness before God—that is, to total spiritual catastrophe. By contrast, we cite the moment before death from the life of St. Sisoes the Great (fifth century). “Surrounded at the moment of his death by the brothers, at that minute when he was as if conversing with unseen beings, the brothers’ asked him, ‘Father, tell us, with whom are you conversing?’ Sisoes answered, ‘They are angels who have come to take me, but I am praying them to leave me for a short time, in order to repent.’ At this the brothers, knowing that Sisoes was perfect in the virtues, protested, ‘You have no need to repent, father.’ Sisoes replied, ‘Truly, I do not know if I have even begun to repent. '”[iv] This deep knowledge of one’s own imperfection is the main distinguishing characteristic of all true saints. “The Holy Spirit,” she writes, says to her, “My daughter, My sweetness … I love you very much.” “I was with the apostles, and they saw Me with their physical eyes, but they did not feel Me as you do.” Then, Angela reveals about herself, “I see in the darkness the Holy Trinity, and it seems to me that I am standing and abiding in the center of the Trinity, which I see in the darkness.” She expressed her relationship to Jesus Christ, for example, in such words: “I could bring myself entirely into Jesus Christ.” Or, “From His sweetness, and from the sorrow of His departure, I shouted and wanted to die.” At this, she began to beat herself so badly that the nuns had to carry her out of the church. Another outstanding feature of Catholic sanctity is Catherine of Sienna (fourteenth century), raised by Pope Paul VI to the highest rank of saint—”Doctor of the Church.” I will read a few notes about her taken from the Catholic book by Antonio Sicari, Portraits of Saints,[vii] published in Russian. These citations (emphasized by me) require no comment. No less telling are the “revelations” given to the “Doctor of the Church,” Teresa of Avila (sixteenth century) also made known by Pope Paul VI. Before her death, she exclaims, “O my God, my Spouse, finally I shall see You!” This exceedingly strange exclamation is not accidental. It is the logical result of Teresa’s whole “spiritual” exercise, the essence of which is revealed in the following fact. Yet another illustration of sanctity in Catholicism is Therese of Lisieux (“The Little Flower,” or “Of the Child Jesus”), who, in 1997, the centennial of her repose, was proclaimed a Doctor of the Church by the “infallible” decision of Pope John Paul II. Here are several quotes from the spiritual biography of Therese, who only lived to the age of twenty-two, which eloquently witness to her spiritual state (The Story of a Soul [Paris, 1996]). “During a conversation before my tonsure, I gave a report of the activities I intend to undertake in Carmel. ‘I came to save souls, and first of all, to pray for priests.’” Not having saved herself yet, she came to save others! The methodical development of imagination is based in the experience of one of the pillars of Catholic mysticism, the founder of the order of Jesuits and great Catholic saint Ignatius of Loyola (sixteenth century). His book Spiritual Exercises is a mainstay in Catholic monasteries, and insistently calls upon the Christian to imagine the Holy Trinity and the conversation of the Three Persons, Christ, the Mother of God, the Angels, and so on. This is all categorically forbidden by the saints of the Universal Church. They testify that when an ascetic begins to live in his fantasies, to look at himself in his own “films,” and believe them, instead of fulfilling Christ’s commandments and struggling with his passions, he comes to complete spiritual and emotional disturbance. The authoritative collection of ascetical writings of the ancient Church, The Philokalia, decisively forbids such “spiritual exercises.” Here are few quotes from that book. How right was that nobleman (St. Ignatius Brianchaninov wrote about him), who, when seeing the Catholic book The Imitation of Christ by Thomas Kempis (fifteenth century) in his daughter’s hands, tore it away from her, saying, “Stop playing romance with God.” The examples cited above leave no doubt as to the reasonableness of these words. It is a great misfortune that in Catholicism, as we can see, people have ceased to differentiate between the spiritual and the emotional, sanctity and fantasy. This is the greatest calamity that can befall any Christian Church. Michael Coren is a Roman Catholic and he is entitled to his opinion. He does excellent work on behalf of the Counterjihad and I respect him. That said, it was the moral obligation of Pope Pius XII to defrock and disavow Stepinac and everyone who was associated with the Ustashe. He did not. What bugs me, having seen the video-clips about Aloyzije Stepinac, is that he did eventually speak up in defence of the Jews and the Gypsies – but not the Serbs (even after Ante Pavelich had his brother imprisoned and murdered)!! It’s exactly as they have it: for Stepinac the Great Schism of 1054 was worse than the Reformation – and that for that reason the Orthodox Serbian PEOPLE were the ones to be blamed of the Yugoslavs for that state of affairs!?!! Where was his sense of Christian duty, of understanding that these still were Christian sheep, even if they were heretical by his “Church”‘s definition?? [Similar things can be raised against Queen (“Bloody”) Mary I of England, Mary Queen of Scots, Kings Charles IX and Louis XIV of France on the one hand; Jean Chauvin (Calvin) and John Knox in Presbyterianism on the other. I for one can’t really blame Russia for being xenophobic. The rest of Europe has never been friendly to Russia and has attempted to make too many inroads over the centuries. But as they say, YMMV (your mileage may vary). The sad truth about Russia is that she frequently in her history has been like a see-saw: either too ready to Westernise OR preferring to instead resist everything and stay in her own semi-Asiatic shell. This state of affairs was really started under Peter the Great – beforehand, Iván IV (“Gróznïy” – “the Terrible / Awesome”) had a bit of experience that way too (he after all waged war with Poland and destroyed the Teutonic Knights. What I’d nevertheless like to stress in my above message is however how much of the time it’s the Russian Orthodox Church that has been one of the leading bulwarks of Russian xenophobia, trying to stop even the Russian people from being able to make more objective decisions as how to interact with the rest of Europe and thence the world, including which innovations to embrace, which inventions to accept at what time. Smokecreen or not, the perspective offered by the gentleman presenting us with this particular view of history, is narrow in the extreme. Certainly the despicable acts of the Ustashi in the 1940s have been lately matched by the brutal regime of Milosevic. Without a doubt, too few Serbs stood up to oppose his rabble rousing in the late 80s and early 90s. On the contrary, there is evidence of widespread support for such distasteful characters as the genocidal Arkan as he was known, and his blood crazed wife, a popular pop / folk singer in Serbia in the 90s. Susannah Heschel’s well documented work Aryan Jesus: Christian Theologians and the Bible in Nazi Germany, points to (with equally few exceptions) a Lutherism that happily embraced the blood curdling, shrill, propaganda of Josef Goebels not to mention the murderous policies of his ideological twin Heinrich Himmler. All in all, a balanced bunch. Verily, it is right to desire and seek the salvation of sinners even before attaining Heaven yourself, for St. Paul wrote, “I have become all things to all men, that I may save some of them.” Did St. Paul imagine that he was their savior? By no means, but rather he proclaimed the Gospel for the conversion of sinners, that they may believe and repent, and so be saved. So too did these holy ones seek the conversion of sinners unto salvation by proclaiming the boundless love and mercy of Christ, even to the point of rejoicing in their sufferings, as did St. Paul. If this seems strange to you, is it not stranger still that the Russian Orthodox Church has a patron saint of atomic bombers? No, it is libelous to impute evil motives on them that love the Lord, and I dare say that one could no more accuse St. Francis of Assisi of presumption than one could accuse St. Paul for saying, “I have finished the race; I have fought the good fight. From now on, the crown of righteousness awaits me, and not only me, but all those who love the Lord’s Coming.” Nor could any accuse Teresa of delusion any more than accusing St. Paul of being a pretender to the title of Apostle after meeting Jesus in person. What then, shall we say of the cautionary words of the earlier saints? They rightly caution against the dangers of demons impersonating Christ, Mary, angels or saints, as well as the dangers of allowing the human imagination to run wild. One can discern genuine Heavenly encounters from delusions and demonic counterfeits according to the doctrines proclaimed by the visionary. Our answer is here in italics. The short answer is that it was not published. Do you pay for this blog or do we? Have you bothered to read our comment policy? Anti-Serbian rants are not published. And we do not publish praise of those who kill Serbs. Editor’s note: Some trolls just never quit. Marija Markic, evidently a Croatian troll, thinks that she has the right to vent her hatred of Serbs on our blog. If we were liberals, we would probably call what Marija Markic is trying post here “hate speech.” We will omit her nasty remarks and publish only her sugar coatings. Our comments are in italics. 1. None of the admins and team members on 1389 Blog are ignorant or inexperienced in these matters. For example, the two administrators have been covering the conflict in Balkans since the Kosovo War in 1999. William Dorich, Sparta, Julia Gorin, James George Jatras and J P Maher have been covering it longer and, for some of them, much longer. None of us receive any funding from any people or organization to support our views. 2. While most of our staff covering the Balkans are Orthodox, J P Maher is a very devoted Roman Catholic, who has lived in the Balkans and visited there many times. He is also a linguist who specializes in the language, (or if you prefer to call them, languages) spoken by both Serbs and Croats. He has gone so far as to visit a town that had supposedly fallen victim to Serbian destruction. Of course, everything proved to be still intact. (It is kind of hard to rebuild a 500 year old building, exactly as it was, complete with mold and age stains, if you want to try to argue that it was somehow recreated after having been destroyed by those eeeeevil Serbs. Yes, he took pictures.) Personally, I find it interesting how many of our Orthodox Saints suffered martyrdom, not under pagans, not under Muslims, not under Communists, but under the thumb of Roman Catholic terror. Even here in North American, we have St. Peter the Aleut who was butchered cruelly by Jesuit priests. Has the Vatican ever bothered to apologize? So, we suspect that anyone who praises those who so freely butcher our fellow Orthodox is not being on the level. Heck, if it were up to me, J P Maher would be the next Pope. He is the ONLY Roman Catholic I know who could ever straighten out the mess in the Vatican. 3. Since we are only human, there may be some things we do not know. So, we have published an email address for the blog. Send the data to us via email, don’t post them here. We just don’t publish that stuff. 4. We are NOT a debate forum. If you want to argue about this stuff, go to Blogmocracy. They debate EVERYTHING. They even have a guy there who is both Roman Catholic and pro-Serb. You will have fun there. We strongly recommend it for those who want do that kind of thing. 5. Don’t insult our intelligence with your groundless lies. Even when you email us, we need sources. Your lies and name-calling prove only one thing: that you are a liar and a defamer. May God Bless you too and open your heart! God doesn’t respect divisions between people: when we come before Him, He’ll NOT Judge us as to whether we were good “Orthodox, Protestants or Romanists”; nor will he look at whether we were good Croats, Serbs, Canadians, Americans, Russians, Chinese or whatever. He’ll Judge us instead as to whether we were good CHRISTIANS!!! If we fail by THAT measurement – and have not accepted that HIS SOLE WAY OF GRACE is THE WAY of our salvation, we’ll be in BIG TROUBLE!!! Postscript: just as I’m part Serb, one of my very best friends is half-Croat and half- Austrian – and we’ve been good friends for over 27 whole years!!! He has done a tremendous amount of good for me and has incidentally proven that Serbs and Croats don’t need to be enemies in the slightest!!! May God Always Be with him!!! Editor’s note: Our better judgment tells us to just delete everything further that this individual, Marija Markic, attempts to post. (If we followed our own comment policy to the letter, that is what we would be doing.) However, we will publish every word of this complaint along with our comments in italics. Well, you should be. We have tried to let you know nicely that this is not the appropriate forum for your causes. We just don’t say nice things about mass murders like Alojzije Viktor Stepinac. If God in his infinite mercy forgives this butcher, fine. Why don’t you play the above video? And it is not just this video; we have known about this individual for years. We just put your first message in the trash along with the many other inappropriate and all too often disgusting comments that we receive on a regular basis. If you have some actual data that might change our minds, you might try to email it to us. That is what email is for. All comments are “subject to comment moderation.” That means that not every comment gets posted. “Comments are moderated to exclude . . . incoherent rambles . . . inappropriate ad hominem attacks . . . and other material that would compromise the quality of this blog.” This sort of rules out praise for a mass murderer that the blog post has just condemned. It also rules out the nasty stuff that you put in the next comment about us. “Blog moderation is not censorship. This is our blog. . . . We support your right to post what you want on your own blog, and to decide for yourself which comments you want to display on it.” This is followed by tips on starting your own blog. So, put what you like on your blog and email it to us. We will look at it, if you like. 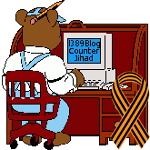 “1389 Blog is a counterjihad blog. We take a conservative stand on other issues as well. We are under no obligation to give ‘equal time’ to any of our opponents, including jihadis or leftists of any stripe.” As any rational being should be able to figure out, we support the survival, both physical and spiritual, of the Serbian people. We, the admins, would lay down our lives for that without a second thought. We thought most people could understand that we would not post anti-Serbian stuff. But then, we guess we need to add that to our policy. “1389 Blog is a blog, not a forum. . . . A forum focuses primarily on discussion and debate among its members. If you are interested in joining a forum, there are plenty of forums and newsgroups throughout the Internet that cover a broad range of subject matter.” Why this is NOT clear is beyond us. Not a debate forum! So don’t argue here! “Comments containing . . . bigoted or racist remarks (especially anti-Semitic remarks), . . . will be deleted.” You said nasty stuff about the Serbian people. We promised to delete that kind of stuff. Why should we grant you special privileges? Which paragraph of my article showed hate? We don’t keep comments that we choose not to post. However, the post you attempted to put up was filled with praise for a man who helped murder many Serbs. If you had a shred of decency, you would consider the fact that 1389 lost all of her Serbian relatives in Europe to the Nazis and their fellow butchers like Stepinac. We have other writers here who lost family to the Nazis in the Holocaust as well. When someone comes here saying good things about those Nazi collaborators, we don’t take very kindly to it. Perhaps you would like to post nice things about other serial killers. Want to say nice things about Jeffrey Dahmer? How about Ted Kaczynski, Ed Gein, or John Wayne Gacy? Do you have nice words for Jack the Ripper? Well, Stepinac and company killed a vastly greater number than those five put together. If memory serves me correctly, your last post was basically a rant accusing the poor Serbs–the true victims of the Balkans violence–of some nasty things. That is what the lame-stream media does. 1389 Blog refuses to help them perpetrate any more blood libel against the Serbs. I resent the fact that I am called a hater, a liar and defamer. Resent it all you like. If you praise the butcher Stepinac, you are a hater. If you blame the victims, you are a liar. This is a well-researched blog. It looks as though you hate that fact. We take great risks to bring the truth to our readers. In similar manner, we take great risks to bring the truth to those whom we meet in person. You want to post things to undermine the truth and have the nerve to complain when we do not print it. Why don’t you print it and let others form their own opinion? You are still trying to dictate our policies. No wonder you find Hitler’s people so “saintly.” Let us make one thing clear: This blog never has been and never will be a site where Nazi war criminals are praised. We don’t care whether the Roman Catholic Church (and/or any of its popes) has seen fit to enable, collaborate with, beatify, or even canonize totalitarians such as Hitler, Goebbels, Himmler, Streicher, or Stepinac – we condemn those totalitarians wholeheartedly. You love dictators because you are a dictator at heart. Apparently, Marija Markic still cannot figure out how to use email. Everyone else seems to be able to email us. We simply won’t post things in comments that should be sent in an email. What she want us to do was not clear either. Previous post: We Just Called to Say We LOVE Israel!